For other routes of the same name, see Red Line. The Red Line (formerly Route 66, also known as the Airport–Windermere Line) is a rapid transit line of the RTA Rapid Transit system in Cleveland, Ohio, running from Cleveland Hopkins International Airport northeast to Tower City in downtown Cleveland, then east and northeast to Windermere. 2.6 miles (4.2 km) of track, including two stations (Tri-C–Campus District and East 55th), are shared with the light rail Blue and Green Lines; the stations have high platforms for the Red Line and low platforms for the Blue and Green Lines. The whole Red Line is built next to former freight railroads. It follows former intercity passenger rail as well, using the pre-1930 right-of-way of the New York Central from Brookpark to West 117th, the Nickel Plate from West 98th to West 65th, and the post-1930 NYC right-of-way from West 25th to Windermere. The Red Line uses overhead lines and pantographs to draw power. The corridor along which the Red Line runs had been planned for use since before 1930, when the Cleveland Union Terminal opened. The first short section, between East 34th and East 55th Streets, was in use by the Cleveland Interurban Railroad in 1920, and in 1930 the line between East 34th and the Union Terminal was completed. It was not until March 15, 1955 that the eastern half of the Red Line opened, from the existing line near East 55th northeast next to the New York, Chicago and St. Louis Railroad (Nickel Plate Road) to Windermere. The line from downtown southwest to West 117th Street opened August 15; this line ran next to the Nickel Plate to the crossing of the New York Central Railroad near West 101st Street, and then next to the New York Central. On November 15, 1958, an extension to West Park opened, and the final section, continuing to Cleveland Hopkins International Airport, opened in 1968, the first airport rail link in North America. Since August 14, 2016, the one-way cash fare on the RTA Rapid Transit is $2.50. A 5-trip fare card can be purchased for $12.50. An All-Day/Cleveland 1-Day pass, allowing unlimited riding on the rapid transit as well as on RTA buses is $5.50 ($2.75 for children 6-17, seniors at least 65 & disabled). Weekly and monthly passes are also available, and there are discounted fares for seniors and disabled. No fare to kids under 6 with fare-paying rider; limit 3. Many of the stations formerly had a secure turnstile system as well as staffed agent booths, but RTA removed them in 2009 at all but two stations in favor of a proof-of-payment system. A Red Line train at West 117th-Madison station. Before boarding, passengers must either purchase (and thereby activate) an All Day Pass, 1-ride ticket, or 5 ride pass or swipe and activate their pre-purchased farecard/pass at a ticket vending machine (TVM). Downtown's Tower City Station also has a customer service center where passengers may purchase a full range of RTA fare media. Once their pass/farecard has been activated, passengers are permitted to enter the station's "fare paid zone" which is clearly marked by signage at each station. While in the fare paid zone, as well as while on the train, passengers are subject to random fare inspections by RTA Transit Police to ensure that each person has paid a fare. Violators are subject to criminal prosecution. At downtown's Tower City Station, the sole remaining station on the line where passengers consistently pass through secure turnstiles, departing riders must swipe their pass/farecard at the gate to gain access to the platform and arriving passengers must swipe their proof of payment card to exit the station. The Red Line uses a fleet of 60 stainless-steel subway-type cars manufactured by Tokyu Car Corporation and delivered to RTA between 1984 and September 1985. The cars have three sets of doors on each side, one in the center and one at each end adjacent to the operator cab. 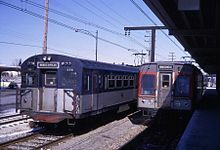 The cars' exteriors originally had orange and red stripes along the sides, but these stripes were removed when RTA changed to a red, white and blue color scheme. Twenty of the cars are operable in single units, and they are numbered as 181-200. The other 40 cars are operable in pairs, and they are numbered as 301-340. The current fleet of Red Line cars underwent an in-house rehabilitation under the direction of former director of rail Michael Couse. The cars were overhauled over the course of five years using federal grant money. Cars received pantographs and controllers, along with rebuilt trucks, traction motors, resistor banks, new flame-retardant flooring, LED lighting, new seat frames, revised interior paneling, and additional open space for improved ADA compliance. The first of the rebuilt cars was unveiled to the public on December 10, 2013. The current cars represent the third generation of cars that have been used on the line. The line opened using a fleet of shorter cars manufactured by the St. Louis Car Company in 1954 and 1955. The cars were 48 1⁄2 feet (14.8 m) long with blue and gray exteriors and are often referred to as "Blue Birds." They were virtually identical to the cars built by St. Louis Car at the same time for what is now the MBTA's Blue Line. Twelve cars were operable as single units with cabs at each end, and 56 cars operable as pairs. The single units were numbered as 101–112, and the paired units as 201–256. Additional cars in this fleet were purchased in 1958 when the line was extended to West Park. These comprised six additional single unit cars (numbers 113–118) and 14 additional double unit cars (numbers 257–270). When the extension to Hopkins Airport was being built in 1967, a fleet of 20 longer cars was purchased to supplement and replace the Blue Birds. These second generation cars, numbered as 151–170, were 72 feet (22 m) long and were built by Pullman-Standard Car Manufacturing Company. The cars, which had a stainless steel exterior with red and white trim and featured interior luggage racks, were promoted as "Airporters." The Airporters supplanted the Blue Birds, except during rush hour when extra cars were needed. In 1970, ten additional Airporters were purchased, numbered as 171–180. With the purchase of the Tokyu cars in 1985, all Airporters and Blue Birds were retired. The Red Line is prominently featured in the final scenes of the film Proximity, starring Rob Lowe and James Coburn. The finale involves a hostage on a Red Line train and a gunfight and chase scene through the Tower City station. ^ a b c d "Red Line (Airport–Stokes/Windermere" (PDF). Cleveland, Ohio: Greater Cleveland Regional Transit Authority. September 8, 2015. Retrieved September 27, 2015. ^ a b "RTA Rapid Transit & Connecting Bus Routes - System Map" (PDF). Greater Cleveland Regional Transit Authority. Retrieved April 12, 2015. ^ "Catalog of "Common Use" Rail Corridors" (PDF). Office of Research and Development, Federal Railroad Administration, United States Department of Transportation. April 2003. Archived from the original (PDF) on September 16, 2008. Retrieved July 19, 2008. ^ a b "Greater Cleveland Regional Transit Authority 2014 Annual Report". Retrieved September 27, 2015. ^ a b "Red Line upgrades fare collection system". Retrieved August 6, 2009. ^ About RTA: History of Public Transit in Greater Cleveland. RTA Website. Retrieved on June 14, 2007. ^ RTA unveils new Red Line cars. RTA Website. Retrieved on 2017-01-22. ^ Grant, Alison (December 10, 2013). "RTA Red Line rail car decked out with new interior". The Plain Dealer. Retrieved January 22, 2017. ^ a b c d e f g h i j k l m n o p q r s t u v w x y z "History of public transit in Greater Cleveland". Cleveland, Ohio: Greater Cleveland Regional Transit Authority. 2012. Retrieved April 12, 2015. ^ "New E. 55th Rapid Station official grand opening". Greater Cleveland Regional Transit Authority (via Archive.org). October 7, 2011. Archived from the original on January 3, 2012. Retrieved April 12, 2015. ^ "Aug. 28: RTA plans ribbon-cutting ceremony at Cedar-University Station". Greater Cleveland Regional Transit Authority. August 18, 2014. Retrieved April 12, 2015. ^ a b Little Italy - University Circle / Euclid - E 120 Station. RTA Website. Retrieved on August 13, 2015. ^ Exner, Rich (March 14, 2005). "Red Line rapid marks 50 years in service". The Plain Dealer. p. A1. Retrieved August 15, 2015. 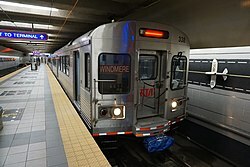 Wikimedia Commons has media related to Cleveland RTA Red Line.